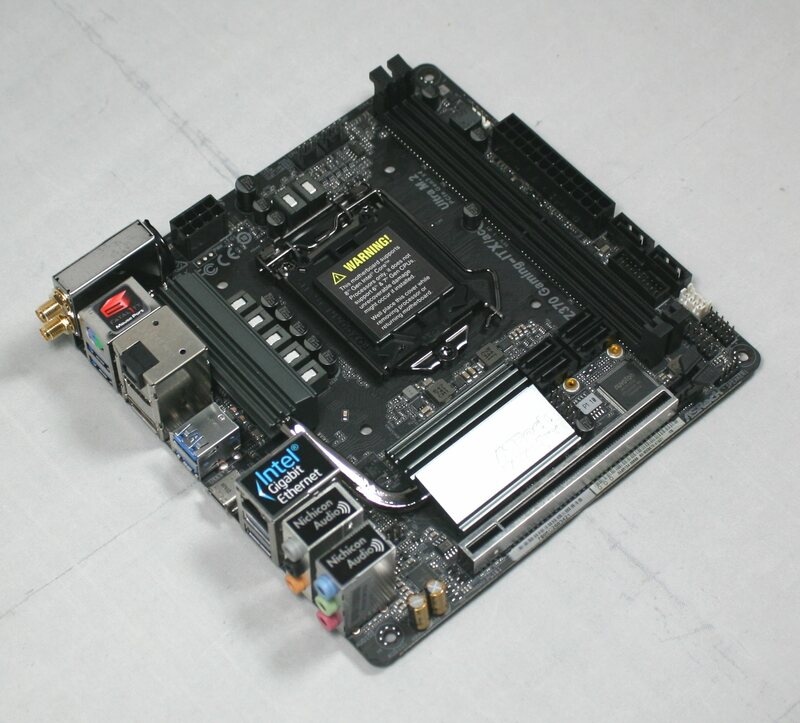 With mini-ITX motherboards, there isn't a lot of room for aesthetics, so they tend to have a fairly basic black PCB. 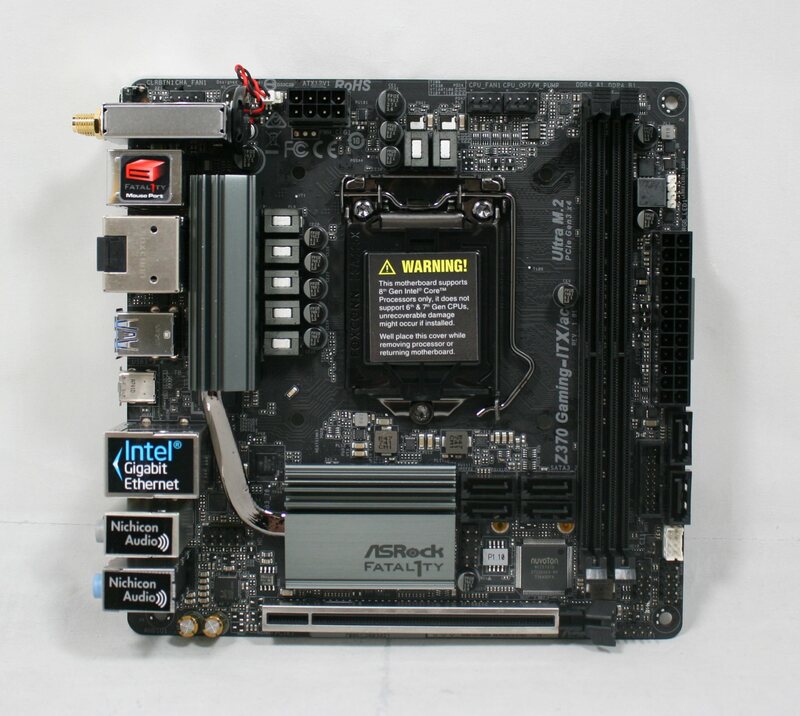 ASRock uses two heatsinks connected via heat pipes to cool part of the power delivery area as well as the PCH. The heatsinks are grey colored and have grooves running through them for the increased area as well as for the appearance. Outside of that, we are able to see the two DRAM slots, as well as the single PCIe slot which is reinforced to help with heavy video cards. The board includes six SATA ports all oriented vertically on the front while the single M.2 slot hides out on the rear. A total of three RGB LEDs line the back of the board under the PCIe slot which gives illuminates the board when on. An additional RGB LED header is located just above the 24-pin ATX connector and supports up to 12V/3A (36W) LED strip. Both the integrated LEDs and the attached are controlled by the ASRock RGB LED software. The ASRock Z370 Gaming ITX/ac has three 4-pin fan headers all located across the top. The chassis fan is located on the left by the Wi-Fi module while the CPU fan and CPU Opt/W Pump headers are to the right. The CPU fan connector supports a maximum of 1A (12W) while the Opt/W Pump header supports up to 1.5A (18W) and also auto-detects if it is a 3-pin or 4-pin device. 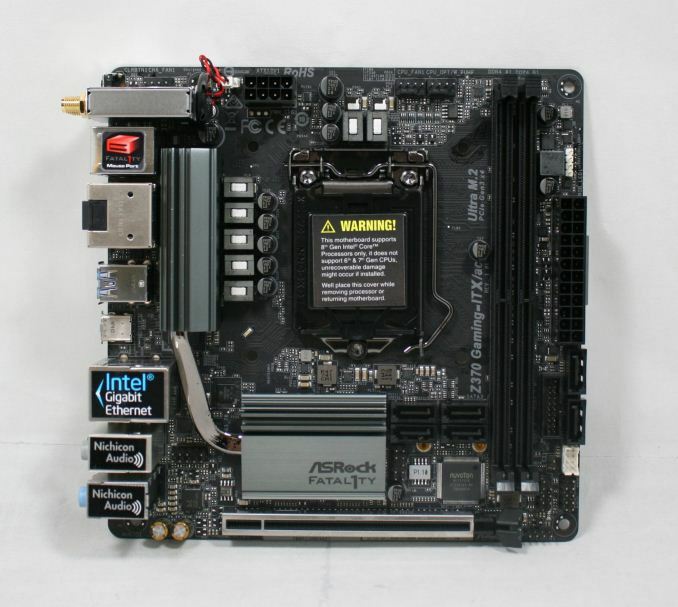 The Mini-ITX board uses a 7-phase power delivery area split up into a 5+2 configuration. Controlling the power is an Intersil ISL69138 digital multiphase controller that can be configured to operate up to seven channels. This unit sends power to the Intersil ISL99227 Smart Power Stage Modules supporting up to 60A. Power is fed to these devices by a single 8-pin EPS 12V connector just above the CPU socket. This solution shouldn't have any issues driving the Coffee Lake CPUs. The right side of the board contains a lot of headers and ports with which to connect a plethora of peripherals. Starting on the bottom we are able to see a USB 2.0 header along with the front panel header just below it. To their right is a front panel USB 3.0 header as well as two (of six) SATA ports. The other four are located on the other side of the two DRAM slots. 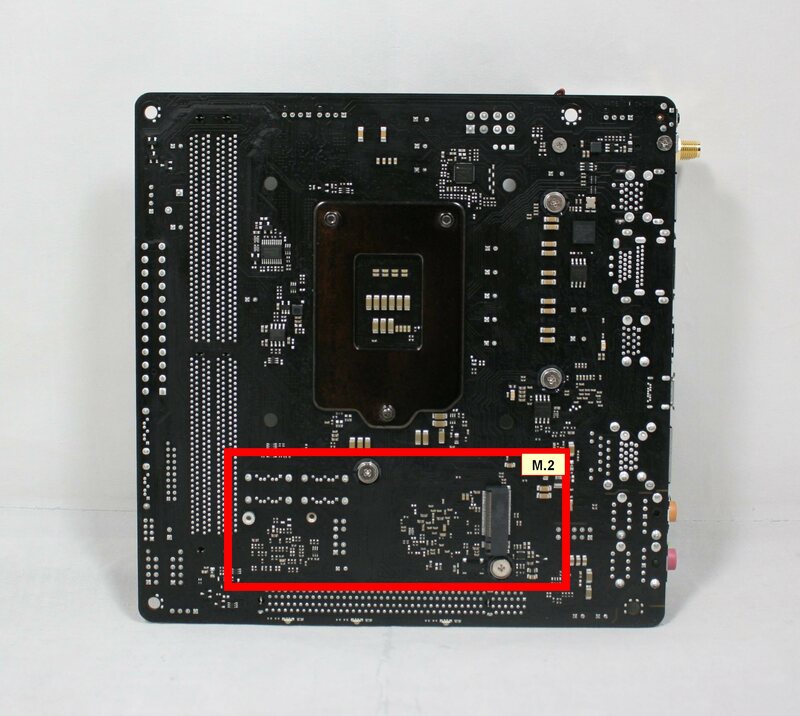 Of note on the SATA ports, when a SATA based M.2 module is used SATA 0 port will be disabled. The SATA ports support RAID 0, 1, 5, and 10. To their right is the 24-pin ATX connector as well as the single RGB LED header in white. 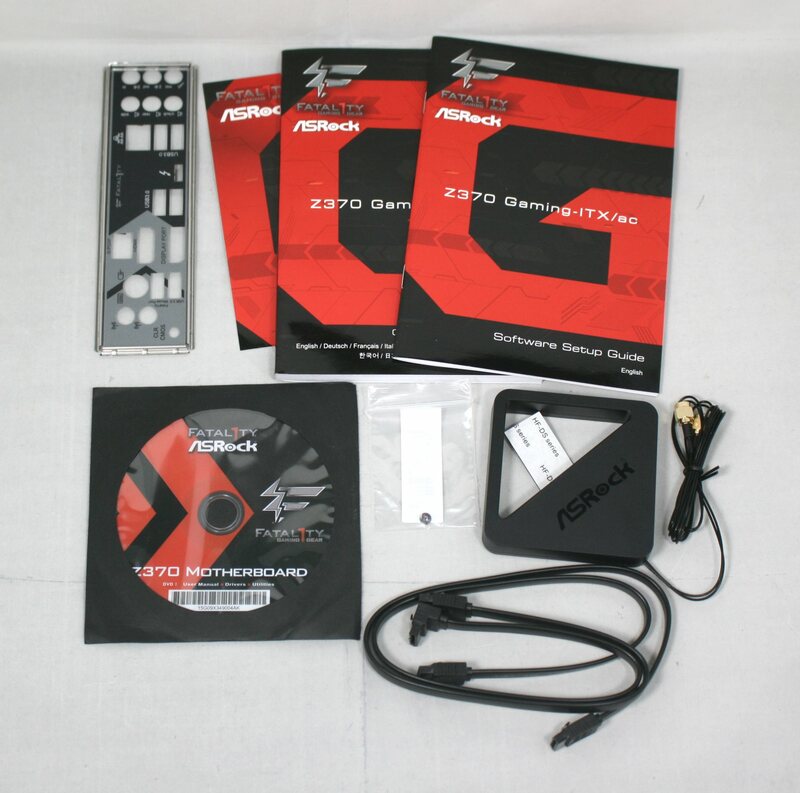 Audio duties are handled by the latest Realtek ALC1220 codec and use Nichicon audio caps to filter the sound. The board includes a Texas Instruments NE5532 OpAmp which auto-senses impedance and supports up to 600 Ohm headsets. The board separates the left and right channels in different PCB layers as well as other isolation methods to reduce EMI interference. The single full-length and reinforced PCIe slot runs at x16 speeds and also supports bifurcation and is able to split to an x8/x8 configuration with a riser card. Here is the Thunderbolt 3 controller, Intel's JHL6240 "Alpine Ridge", which is a low-power PCIe x2-based controller. This comes out to a USB Type-C port on the rear panel, which can also be used as a USB 3.1 port and supports Power Delivery 2.0 up to 36 W (12V at 3A) for fast charging. The port also supports DisplayPort USB-C modes up to full 4K at 60 Hz. The back panel IO (below) is relatively busy with multiple stacks covering USB, audio, network, and video outputs. A complete list is found below ordered from left to right. For a gaming motherboard, this is pretty barebones, most likely to keep the price down. Totally upgrading to this from my ASRock H87M-ITX, which has held solid for 4 years with an over locked i5-4670k. Warning to prospective buyers. Today's date is 7/13/2018. Check out the driver and software page for this board. Nearly everything is from 2017. You're doing it wrong. You or anyone else should never, ever use the mobo driver page for ongoing and latest support. At best, it's just there to get you booted. Everyone is the same. You never get the latest drivers. Never. True, I wouldn't put any weight into "drivers" from partners. You get drivers from OEMs. When was the last time you went to evga.com to get nVidia drivers? Think about it. Do you still have this motherboard? 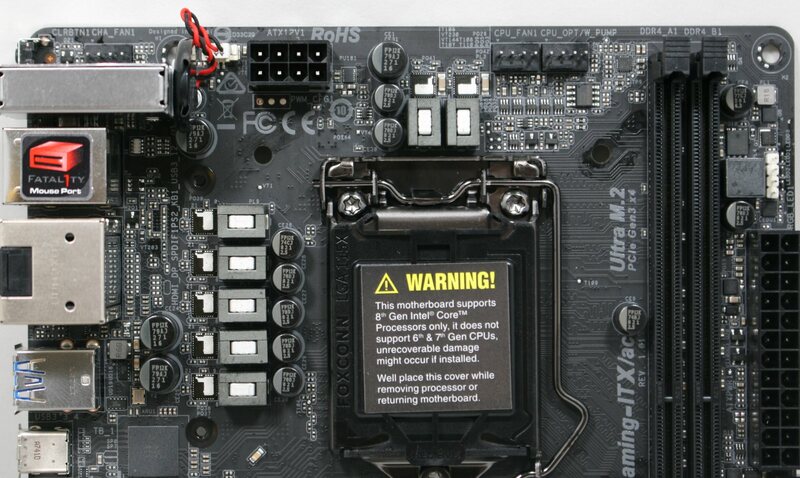 I have this board and, for the life of me, I can't figure out what that white 8-pin header does next to two of the SATA ports. 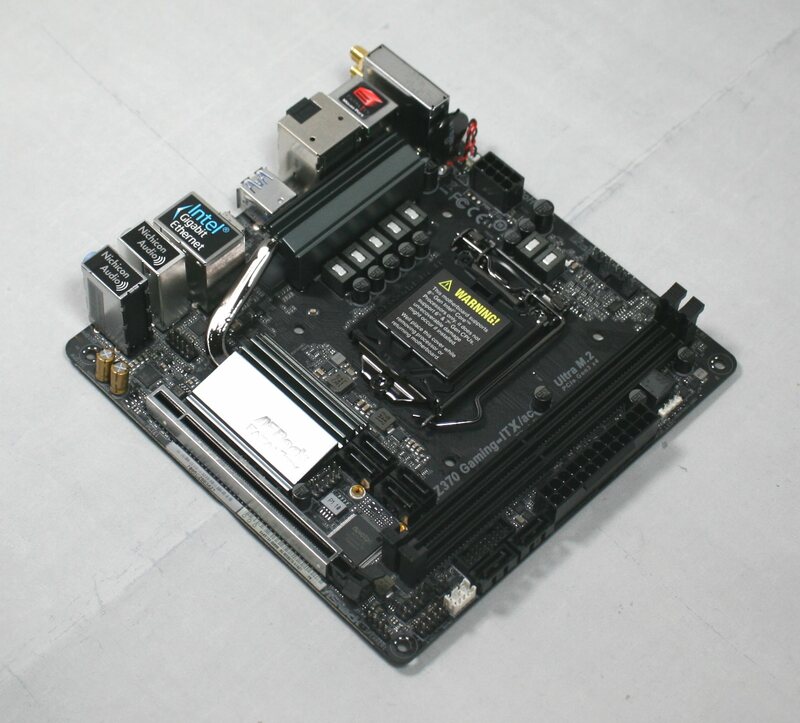 Thought mine was weird, but even your sample has it--most mysteriously, none of ASRock's other Z370 motherboards have it nor the ASRock Z270 Gaming-ITX/ac! Oh, right: I love this motherboard. Absolutely fantastic: excellent list of full-fat features, runs cool (def. disabled MCE, though), excellent RAM overclocking support, proper 2x2 WiFi, BIOS is complete and full-featured, ASRock updated expeditiously for Spectre/Meltdown (big kudos from me as software support starts to differentiate these commodity products), simple layout, no real gotchas (except the TB3 is only wired as PCIe 2x instead of 4x--but who is honestly driving eGPUs or wild iGPU-heavy docks from a gaming mini-ITX motherboard?! ), and the built-in RGB is fun to play with (and syncs nicely with proper lighting).